New Castle, DE — A community is now in mourning, searching for answers after 20-year-old Ty Sawyer was killed at a party, reportedly by Patrick Downey, a University of Delaware hockey player. As we previously reported, no charges were filed as police immediately ruled the killing “not a homicide” before even investigating the case. Sawyer was then taken to Christiana Hospital only to be pronounced dead while his mother held him in her arms. While police are sticking with the narrative that the boys were “mutual combatants” and there is no evidence a crime was committed, what’s changed is that they now say they are investigating the fight. It has since been revealed that Patrick Downey has a documented history of violence. Just two weeks prior to the “fight” that killed Sawyer, Downey was charged with assault after he attacked his girlfriend and smashed her phone in the street. Allegedly, the couple fought while Downey was driving her home, drunk, and became angry at her for spending time with her friends, causing her to get out of his vehicle. Downey sped away but decided to go back and find her, attacking the girl when he caught up with her at South Odessa Boulevard and Glen Mohr Drive, according to police. Police went to Downey’s home to interview him after the young girl called police and showed them her injuries. An officer gave Downey a breathalyzer test after smelling alcohol on him, which showed a blood alcohol level of 0.118 percent, well over the legal driving limit of .08 percent. Downey was charged with third-degree assault, criminal mischief under $1,000 and underage consumption of alcohol. After he was released on bail, Downey was ordered by Magistrate not to have any contact with the young woman, which he ignored. He was subsequently charged by New Castle County police for violating his bail conditions and a no-contact order after the assault arrest. “Pat Downey, [I] played hockey with him for many years. He is crazy and very dangerous. We called him Penalty Pat. Was always in penalty box for vicious and stupid plays. Thrown out of so many games I couldn’t begin to count. Even had restraining order and charges from one of the other teams parents after he threatened him after a game. I really hope he doesn’t get away with this,” said the source. “This is a PEACEFUL march in Middletown to show our demand for Ty Sawyer’s voice to be heard. This is a chance for us to give him what he deserves, to defend him. After the countless times he has helped each and every one of us. Let us keep his story alive so this case isn’t swept under the rug. 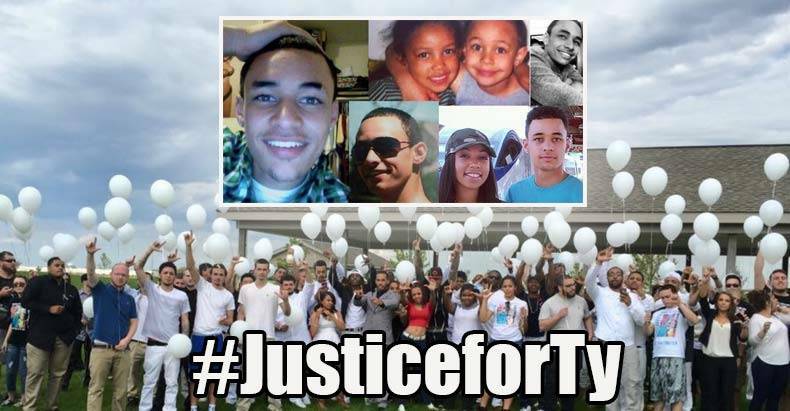 Friends of Ty have been posting to the page urging witnesses to come forward, some showing support for Ty and his family, some leaving their heart-wrenching goodbyes to a wonderful young man with a bright smile, gone way too soon.